The band are playing in France tonight heading the Rock In Opposition Festival in Toulouse. Regards and thanks Geoff here’s to the next ten years! I completely agree with Martin: the magnificent sound of Geoff (with all the musical instruments that he played but especially with viola!) 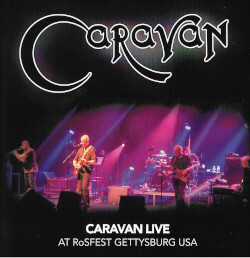 over the years has become the cornerstone of Caravan’s sound.I never tire of saying that the artistic talents of the members of Caravan go hand in hand with human qualities particularly in Mr. Richardson. We will continue to follow you in this wonderful journey in music that excites us for so many years. Well done Geoffrey for your superb musicianship for all these years particularly with CARAVAN and with Jim and of course your solo works.Hope to see you and Jim at the coach and horses in november.My biggest wish is that you and CARAVAN continue for many more years giving us the brilliant music i have listened to for the last 40+ years. ALL THE BEST! Yes congratulations on your magnificent input….i must admit you had to win me over initially as i saw Hastings Sinclair Sinclair and Coughlan as THE definitive Caravan but your superb musicianship brought a new dimension to the band….saw the band dozens of times in the late 60`s and throughout the 70`s….always my favourites of that genre!….last saw you all at Limelight Club in Crewe in early 2000`s…..absolutely superb! !…..nice to see a Hinckley lad do well Geoffrey…..my school used to play rugger against Hinckley Grammar School in the 1960`s….anyway thanks for your great music over the years…..look forward to seeing you at the Lowry early next year…..Manchester gig long overdue!